differencemakers community blog: The Secret to Success with Your On-Line Strategy: Experiment! The Secret to Success with Your On-Line Strategy: Experiment! 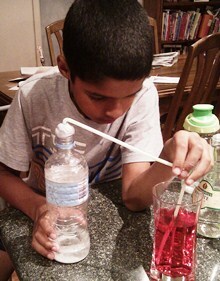 I was recently helping my nine-year-old nephew Riley with a science experiment, which he was going to demonstrate in class the next day. It involved some weird combination of flour, baking soda, food colouring, straws and bottles, and we were able to create some sort of gas that bubbled, frothed and made a clear liquid change colour. It was great fun setting it all up! But after we did the experiment the first time (and it worked! ), Riley was full of questions about it – like how to make it last longer, how to make more bubbles, what would happen if we changed the mix of ingredients, and so on. We didn’t know the answers, but we were willing to try different things to see what effect they had on the result. I wish more people would experiment! It struck me later that this process of experimenting – in particular, the spirit of experimenting – is what we all need as business owners, especially when it comes to what we do on-line. Whether it’s running webinars, creating a Facebook page, trying out Pinterest, doing something different in your blog (or even blogging at all! ), or tweaking the subject of your e-mail newsletters, it’s worth trying different things to see what effect they have on your results. Here are five reasons why it’s useful – in fact, essential – to experiment more in your business. 1. There are no hard-and-fast rules. There really are no fixed rules about what will work on the Internet. Sure, there are some strong, time-tested principles (give in order to get, build your authority, don’t try to reach everybody, solve your target market’s problems, and so on), but the exact way you put them into practice varies for every business. So everything you do is an experiment anyway, and if you don’t keep experimenting you’re relying on hitting the jackpot on your very first try! 2. It’s all changing so fast. Even if you have built a solid business already, the world is changing so fast that it might only take a tiny chink in your armour to expose a small weakness that quickly challenges your entire business model. It happened with Apple and the music industry, Amazon.com and the publishing industry, mobile computing and the PC industry, and any number of things affecting the speaking industry (webinars, 9/11, the Out of Office work style, and more). If you’re lucky, your business will be shaken to the core by something big. If you’re unlucky, it will happen so slowly and insidiously that you won’t notice until it’s too late! 3. Your clients are expecting it. Even if you aren’t experimenting, your clients are. They aren’t spending hours discussing the 30% increase to your keynote fee; they are exploring ways to eliminate the annual conference altogether. They aren’t thinking about your workshop fee; they are wondering how to make up for the lost productivity of their people attending the workshops. They aren’t debating whether to pay business-class airfares for you; they are wondering whether they can slash all their travel budgets and use virtual meetings. Even if they are thinking specifically about your services, they are wondering how to get the same results in other ways. So you’d better be thinking of these other ways as well! 4. Your competitors are already doing it. Even if your clients aren’t aware of some of the changes happening around them, you can bet your competitors are. And it’s not necessarily the big, well-established competitors with deep pockets you need to worry about. Your biggest threat is probably going to come from smaller, more nimble, more agile competitors who are tapping into the power of the Internet to reach your clients with your message, and deliver (or at least, promise to deliver) the same results as you. 5. It’s easy to do. One of the best things about experimenting on-line is that it’s easy to do – especially compared with a lot of off-line tactics. You don’t have to completely reinvent your business. You simply have to change a newsletter subject, try out a new app on your phone, conduct a quick survey on-line, run a private webinar for a small group, or answer a few LinkedIn questions in a group where your clients hang out. So there really is no excuse! Remember that your clients and competitors are already doing things differently, so you just can’t afford not to experiment! Are you seeing through their eyes? What do you do when you come up short? Catching People Doing Things Right!